(NaturalNews) The complexity of the human body is vast, consisting of trillions of cells working simultaneously to ensure that we take our next breath. While the processes are complex, the method by which they perform is quite simple. In order for our cells to do their job, they need vitamins. Researchers believe that the body requires at least 13 different vitamins to be healthy, according to a report at HowStuffWorks. Maintaining the recommended daily intake of all 13 vitamins can be challenging, with some falling lower on the priority list than others. A recent study by the College of Public Health and Human Sciences at Oregon State University found that nearly everyone is suffering from vitamin E deficiency, with the exception of those who work diligently to meet the recommended daily intake levels. At least 90 percent of men and 96 percent of women fail to consume their recommended daily amount of vitamin E, according to a broad survey. This deficiency is particularly harmful for children and women who are nursing, pregnant or may become pregnant. Research suggests that vitamin E is incredibly crucial during the first 1,000 days of an infant's life, contributing to important neural growth during fetal development that cannot be replaced later in life. A study which analyzed the effects of vitamin E on experimental animals during early development showed the nutrient's ability to protect the function of omega-3-fatty acids, which play an important role in brain development. "It's important all of your life, but the most compelling evidence about vitamin E is about a 1000-day window that begins at conception," said Maret Traber, the study's author. "Vitamin E is critical to neurologic and brain development that can only happen during that period. It's not something you can make up for later." Researchers believe that vitamin E intake is especially important for young children up to two years old. Higher vitamin E levels and improved cognitive function share a correlation, according to Traber's study, which was published in Advances in Nutrition. Children with inadequate vitamin E levels can experience neurological disorders, muscle deterioration, cardiomyopathy, stunted growth, infection and anemia, according to a review of multiple studies. Adequate vitamin E intake is equally important for mothers, with proper concentrations helping slow the progression of diseases such as Alzheimer's and dementia. Foods containing high levels of vitamin E aren't exactly at the top of our list of most beloved foods, although some are quite tasty. 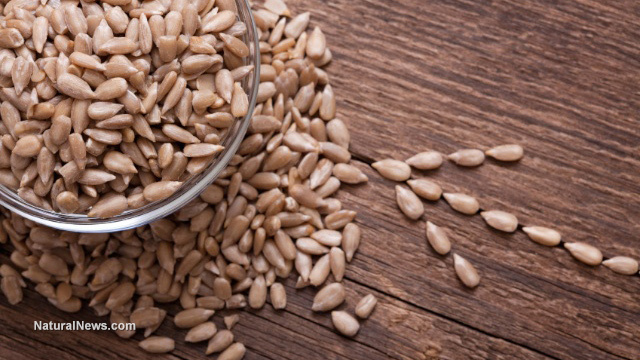 Sunflower seeds are both low in calories and high in vitamin E. You can also obtain the nutrient's antioxidant properties from pumpkin and sesame seeds by eating a little under one-third a cup a day to meet recommended daily levels. Almonds are another great source of vitamin E, with just an ounce offering 7.5 milligrams. Swiss chard and mustard greens are great sources of vitamin E; consuming one cup of either gets you 14 to 17 percent of your daily recommended intake. Also, turnip greens, kale, hazelnuts, pine nuts, avocado, broccoli, parsley, papaya and olives are excellent, healthy sources of vitamin E. For recommended individual serving amounts, click here. You can obtain vitamin E through some plant oils such as sunflower oil when cooking. Wheat germ oil is believed to be the best source for vitamin E, with just one tablespoon offering 100 percent of the recommended level. Hempseed oil, coconut oil, olive oil and safflower oil are all vitamin-E-rich oils. Unrefined and organic oils are always the best.